When you’re struggling to grow your business, effective marketing is one of the most efficient ways to get it back up and on its feet. But you can’t always afford to hire an experienced marketing specialist because, frankly, people are expensive. Plus, one person may not have all of the skill sets and experience required to provide you the level of marketing you need. So, you remain mired in a world where you’re “kind of” marketing by doing it yourself. Actually, you’re just dabbling and are stuck in a trap of weak branding, lukewarm leads and dwindling sales. There’s a simple and clever solution to this common problem: Fractional marketing - hiring an agency on a part-time basis to develop and implement a powerful marketing strategy for you. This part-time agency can act as a catalyst to kick-start your firm’s growth. Your customers have changed the way they buy. They prefer to do their own product and vendor research and don’t want to talk to a salesperson until just before the sale. As a result, they’re not responding to traditional sales strategies. In today’s world, educational marketing (better known as content marketing) has emerged as a proven strategy for building trusted relationships with prospective buyers that lead to sales. Helpful, educational content acts like a magnet to attract prospects who are in the early stages of buying. By becoming a trusted subject matter expert in your industry, prospective buyers will naturally tend to gravitate to your company. Developing high value, informative and engaging content on a regular basis has become more complex and time-consuming. Creating ebooks, white papers, blog posts, direct mail campaigns and videos takes time – time you probably don’t have. The number of channels you can use to communicate with your target audiences has exploded during the last decade. Which ones should you focus upon? Which should you ignore? The volume of content that you must compete against has also increased exponentially. In other words, it’s getting harder and harder to get and keep your target audience’s attention. Marketers must deploy high-quality content to multiple platforms, including mobile – and soon, voice-activated platforms. In order to achieve adequate visibility with buyers, most organizations must invest in paid promotion on social media channels and must also cultivate influencer networks. These tactics add even more complexity to the mix! Now that content marketing is the preferred strategy for attracting and engaging audiences, the competition for experienced marketing strategists and creators is like a shark feeding frenzy. The best people are significantly more expensive, because demand has far outstripped supply. Even if you’re lucky enough to hire a really smart marketing person, you may have problems retaining him or her. For the cost of a single employee, who has a limited skill set, a digital agency can work on your marketing priorities for a set number of hours per month. You get access to an entire team, with its diverse talents – everything from content writers and SEO people to web developers. You gain a valuable outside perspective on your business challenges and opportunities, as well as some new ideas to solve them. The agency can develop and execute marketing and sales support strategies. The agency brings best practices and proven tactics it can apply to your marketing challenge. The agency can act as a catalyst to jump-start an effective, results-driven marketing program. When does all of this make sense? When the business needs to step up its marketing game, but can’t support the hiring of a full-time person. Situations where an outside marketing strategy perspective is needed. When a firm needs a repeatable process to drive growth. When a company needs smarter-than-ever marketing that supports your salespeople, so they can compete effectively. What does a fractional agency relationship look like? Typically, the agency begins engagement by conducting research to understand the challenges the client is facing. It conducts interviews with key customers and customer-facing executives within the organization. From this information, the agency team develops a marketing strategy that is focused on creating the right message and distributing it at the right time via the right channels to influence customer behavior. As soon as you and your new marketing team are in agreement on the strategy and tactics, the agency team will begin implementing the plan – freeing you to concentrate on higher-value tasks. Can your company benefit from some marketing oomph? 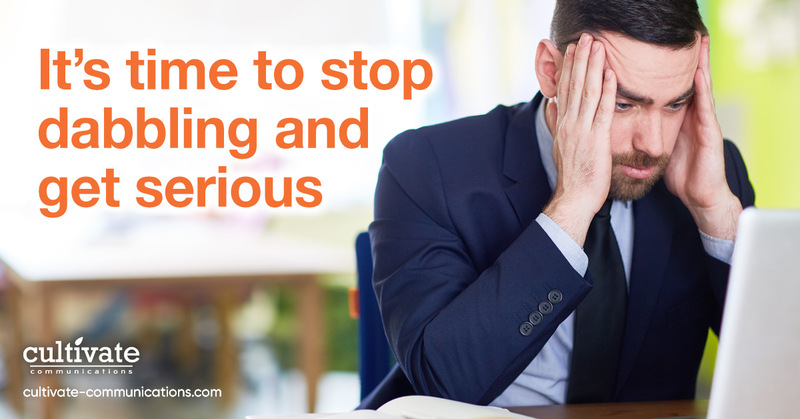 Now’s the time to stop “dabbling” and get serious about marketing your company. Hiring a fractional marketing agency may be the solution and could put you on the road to greater revenues.